The mongoose is a small rodent-like animal found naturally in most parts of Africa and in parts of southern Asia and Europe. The ancient Egyptians domesticated these wild creatures and considered them sacred. Agility and cunning are usually enough to ensure the mongoose draws first blood, yet even if this fierce, furred critter is bitten by its scaly foe, its thick coat and resistance to snake neurotoxin venom means it can still recover and emerge victorious. The mongoose is mainly a terrestrial mammal, meaning they live on land, but some species have adapted to living in tree tops or partially in water. On land, they live in burrows, holes, or rock crevices. 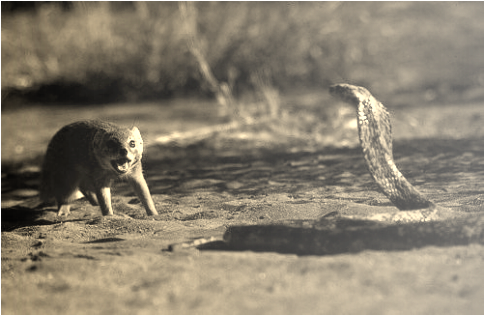 The mongoose became resistant to this venom in that it has a line of defense against the venom. Its acetyl choline receptor has "evolved" so that the neurotoxin cannot bind it. A set of changes in the mongoose's receptor makes it resemble the snake's own resistant receptor. Therefore, the mongoose's resistance is caused naturally by evolution. Benefits: Not being harmed by exposure to snake venom/bites. Being able to compete with live snakes with no worries. Resistance allows them to eat snakes and their venom. Negatives: Possibly an over population of mongoose as a result of most of them not being killed by snakes. The mongoose(right corner) is affected when there are a lack of reptiles(snakes) in its environment. Humans affect mongoose and their habitats by taking up more space on Earth for our homes and cities. We pollute habitats. We illegally hunt and kill animals. We bring exotic species into habitats. All of these activities take resources and habitats away from plants and animals. Although humans kill snakes to keep them from harming people, the food web will be destroyed and mongoose will lack nutrition and possibly become endangered. Human activity often changes or destroys the habitats that plants and animals need to survive. If the King Cobra encounters a Mongoose it will try to flee, if that doesn’t work it will make itself big and show the Mongoose his ribs, however the Mongooses mainly aren’t impressed and eat them. Surprise!! !...SO YOU'RE TELLING ME NOTHING HAPPENS TO MONGOOSES WHEN THEY ARE BITTEN BY SNAKES!? "AHHH...YES! LIVING THE GOOD LIFE AND NOT KILLING OVER WHEN BEING BITTEN BY MY 'DINNER'!"